Eiko Ojala made this piece for the The New York Times. The image is Ojala’s response to two different views of planet earth: one contemporarily voiced by Donald Trump and the other expressed in the mid 60s by the then U.S. Ambassador to the United Nations. 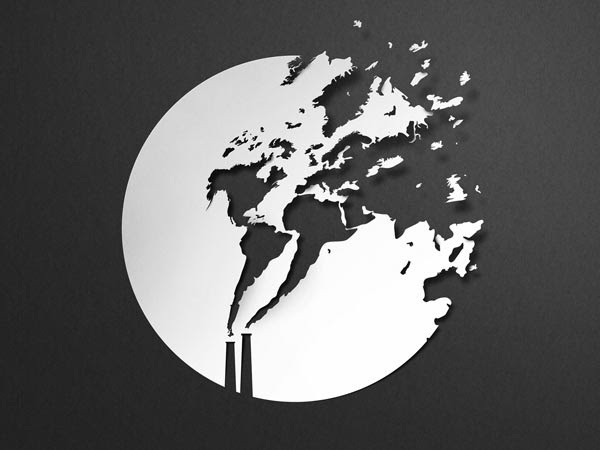 Ojala illustrates the destruction of Trump’s withdrawal from the Paris climate accord in his depiction of the dominant power plant chimneys disconnecting the rest of the world, metaphorically undermining the Ambassador’s call for world unity and respect for earths’ ‘vulnerable reserves of air and soil’.